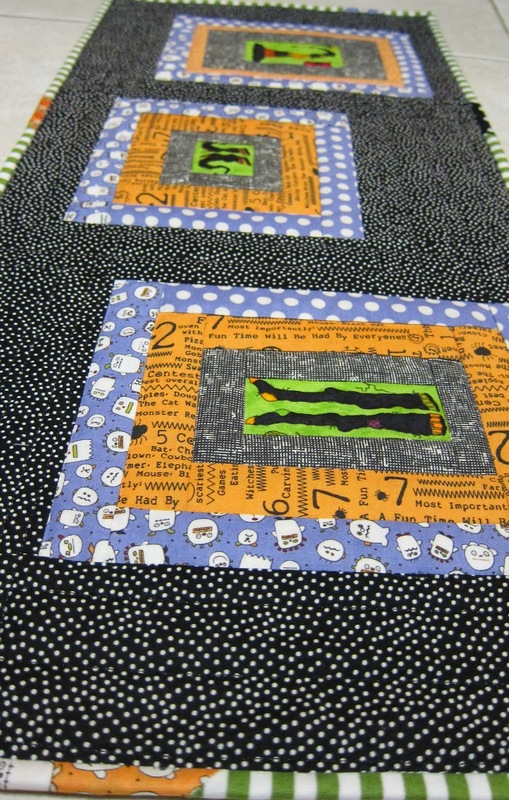 This one is made with my coveted "witches' undies". metal bench and awesome pail. I'd like to give away my Halloween scraps, which is mostly Sweetwater's "Boo Crew". If you'd like them, leave me a nice comment. Love the cute fussy cut Halloween blocks. Your table runners looks great! Gorgeous fabrics. Love the market finds, especially the metal bench. Love the centres of your table runners. Your 'finds' are all very interesting. I think I like the copper pot and the metal bench the best. If you're willing to part with your scraps, I could put them to good use. There's a couple of daughters of mine that love Halloween and I'd love to make them something unique. I've followed your blog for a long time. I would love to win the Halloween fabric! I am collecting fabric for a Halloween Sun Bonnet Sue where she would be dressed in halloween fabric. cute? Hope so! Your halloween table runners are just too cute! That little mummy on the first one is just adorable. I love funny/cute halloween stuff way better than the scary stuff. Oh, and I love a good scrappy (and stripey!) binding. Great job! 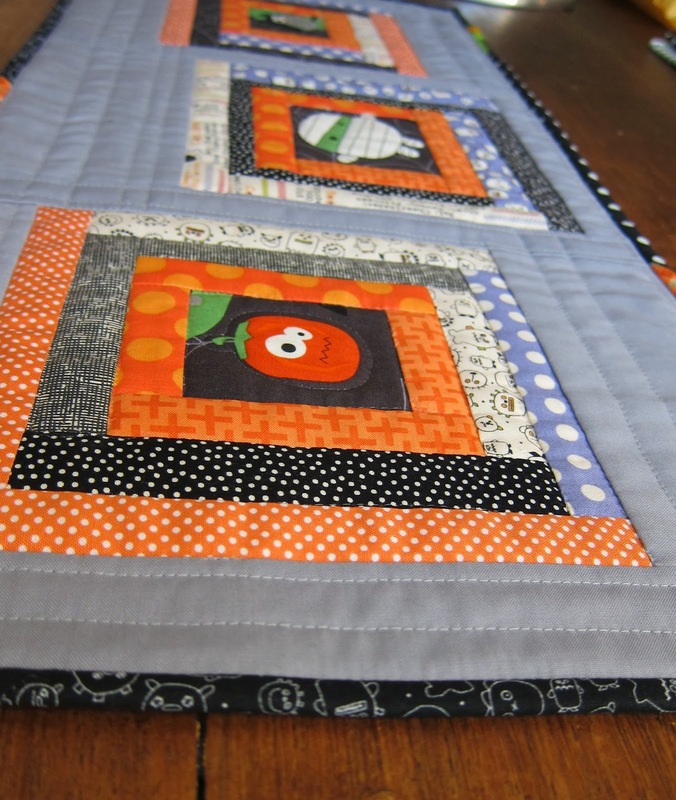 I love your Halloween runners - I'd be thrilled to win your boo crew scraps! Your runners turned out so cute! Great job! Oh, how cute are these runners! Great design to show off those fabulous seasonal prints. Your grandkids are going to love receiving theirs - that little mummy had me chuckling! 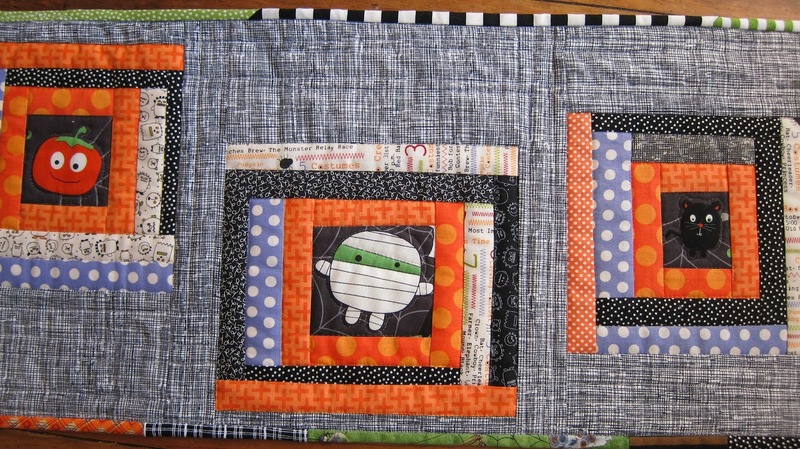 It is amazing what can be made with fabric scraps!!! Hoping you pick me because I've got some fun ideas already!!! Loving your table runners too!! a nice comment is easy peasy given your fun table runners and fabulous finds, love it all! Your runners are so cute. Is this your pattern? I have a hoarded fat quarter of the witch's underwear. If I win your scraps, I'll be able to make a table runner. Cute, cute cute table runners! I love Halloween and fall. I would love to copy your pattern, so cute! Thanks for a chance to win! I used to live in Texas and I loved Roundtop, I sure do miss going, we would also hit up Warrenton (I think that was the name, a little town on the way to Roundtop from Houston). Love the park bench. The Halloween scraps are awesome, but anything Halloween strikes my fancy, thanks for the giveaway opportunity. I just love your witches undies!!!! What a great use of that fabric! I also love the Boo Crew and would be THRILLED to win your scrappies! Halloween is a huge favorite of mine, and I just bet that you share this opinion! I've been admiring Halloween table runners for the last week or so - I think yours have convinced me to give one a try! Adorable fabric! I love the pumpkin & the black cat. They have such personality! Love your table runners! So cute! I love your table runners! I would love to win the scraps. I am new to your blog. I found you through crazy mom quilts finish it up Friday series. I find the best blogs by browsing that list every week! I look forward to seeing what you post next. Happy Fall! Love the table runners and i can't believe you found a copper pot that cool! Would love your scraps!